MANILA, Philippines Philippine Energy Secretary Jericho Petilla pledged Monday to restore power in all typhoon-battered regions by Dec. 24. Petilla told a news conference in Palo, in hard-hit Leyte province, he was ready to resign if he failed to meet the Christmas Eve deadline. “It's difficult to celebrate Christmas without light," he said. He did acknowledge that the task, which would involve erecting about 160 giant power transmission towers and thousands of electric posts toppled by Typhoon Haiyan, was an impossible mission. The storm, one of the strongest ever, laid waste to large sections of Leyte and Samar islands, and left more than 5,000 people dead or missing. According to the National Disaster Risk Reduction and Management Council, there are 3,976 confirmed deaths, 1,598 still missing, and 18,175 injured as a result of the disaster. 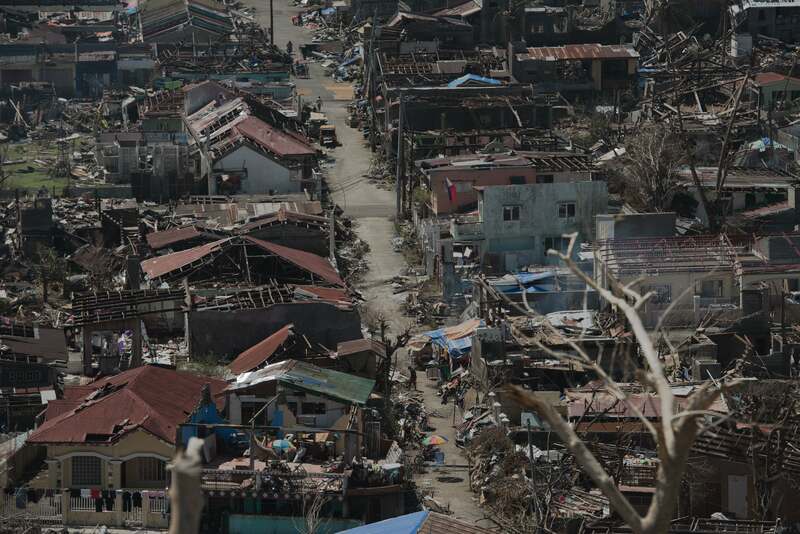 Meanwhile, aid workers, heavy equipment and lifesaving supplies flowed into regions devastated by Typhoon Haiyan on Monday, as the global relief effort moved into high gear. On the ground, there were further signs that battered communities were beginning to shift from survival mode to one of early recovery: markets were beginning to reopen, though with very limited wares, some gasoline stations were pumping and residents were repairing damaged homes or making temporary shelters out of the remains of their old ones. "The darkest night is over but it's not yet 100 percent," regional military commander Lt. Gen. Roy Deveraturda said. The first week of the response was inevitably chaotic because airports into the region were damaged and local governance structures shattered. At the main airport in Tacloban, a pay loader was shifting pallets of water and sacks of rice to trucks. On the main road, teams were shifting debris into trucks. Military and civilian teams from around the world have arrived to bolster an immediate response by local people and national authorities. The U.S. government and military have been at the forefront in helping one of its Asian allies. Washington's aid arm announced a further $10 million, bringing to $37 million the amount it is committed to spending. "This will enable us to continue to move ahead with our help on things like the water system, on the logistics," said USAID assistant administrator Nancy Lindborg. "We have a steady drumbeat of supplies coming in and being distributed." On Sunday, President Benigno Aquino III toured the disaster area and promised to step aid deliveries. Aquino, seen as reformist president who had enjoyed considerable public support, has had to deal with a string of crises over the last year. His administration has been criticized by some over its apparent failure to strictly enforce evacuation orders.